At present, the primary sources of income for the people in most villages are agriculture and daily labour, with only very few people having regular jobs. The profitability of marginal conventional agriculture has declined so dramatically over the last few decades that many farmers have been driven into economic and psychological depression. The only alternatives are daily labour jobs, which pay, on average, ₹300 per day—approximately $4.20 US. However, the work is highly irregular and also does not offer much emotional reward. Much of the income from daily-labour jobs is spent on alcohol and tobacco, before it ever reaches the families waiting at home. In the villages, women are doing a lot of manual work, both in the household and in the fields during the main agriculture seasons. They carry large quantities of water in pots hoisted up to their waists or gracefully balanced on their heads. They also help prepare the fields, plant the crops, and are fully involved in the harvests as well. When the family does not have enough basic income from their agriculture, the women too are forced to go for daily labour, inevitably leaving children and households to manage for themselves. It is clear that additional income opportunities must be nurtured in the villages. There are many kinds of enterprises that can be started by villagers, most of whom don’t have access to sophisticated equipment or specialised education. Over the last five years Amrita SeRVe has supported a vast range of different income generation projects. A Self-Help Group (SHG) is formed by 10 to 20 individuals, typically women, who agree to meet once or twice a month to deposit a regular amount that is decided upon by the members. Amrita SeRVe is supporting women in organising themselves into SHGs. Their monthly savings are paid into a joint bank account that is opened in the name of the SHG and managed by a group-elected president and treasurer. As these savings build up, SHG members in need of an immediate short-term loan are able to make a request at a group meeting. When approved by the other members, the loan will be given at a small interest rate along with a feasible repayment schedule. There are several benefits to this self-administered micro-finance scheme, such as an absence of hindering bureaucracy on the one hand, and an increase of group earnings through interest collection on the other. However, the real advantage of an SHG lies in the strength of the community spirit that develops over time. As these women pool their resources and get used to collective decision making on a financial level, thousands of SHGs mentored under the M.A. Math’s AmritaSREE project in Kerala have demonstrated clear signs of empowerment. These groups have grown into highly efficient and compassionate institutions, benefitting not only their members’ families, but their entire communities. For Amrita SeRVe, the SHGs are one of the primary gateways into the community. Health workers are joining SHG meetings at least once in a month to give awareness on various health-related topics. In addition, each SHG is asked to appoint one health leader and an education leader to take the responsibility of looking out for other members and their families in regard to their health and education. In the domain of health, for example, people who have fallen sick are encouraged to visit a hospital. Furthermore, they can explain hygienic practices and set an example. At the same time, the education leader will keep an eye on regular school attendance and continuation of studies of members’ children. If in any area there seems to be lacking, it can be addressed in the group and collective solutions can be found. 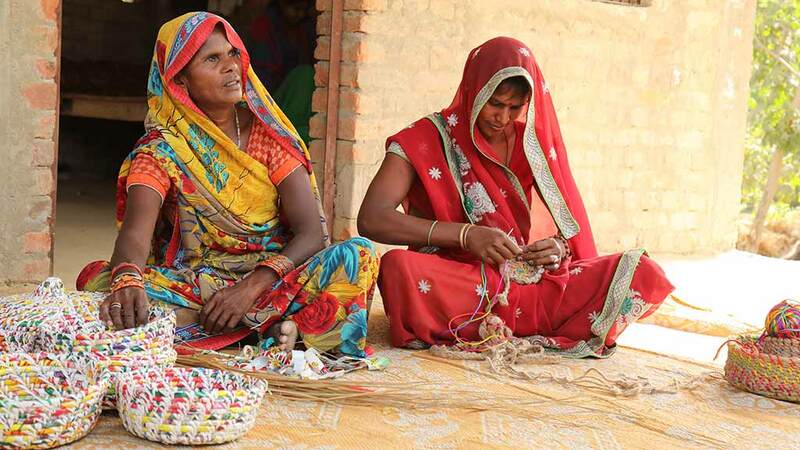 It is through SHGs that Amrita SeRVe implements income generation projects. The women are encouraged and supported in every possible way to start an income-generating venture. The M.A. Math has offered all of its affiliated and eligible SHGs dedicated seed money to their accounts.The intention behind this boost in their common fund is to increase their lending base, as well as making it easier for them to embark on an income-generating activity. Village coordinators also deliver stories on empowered women and moral values adapted from India’s great epics for reflection and inspiration.